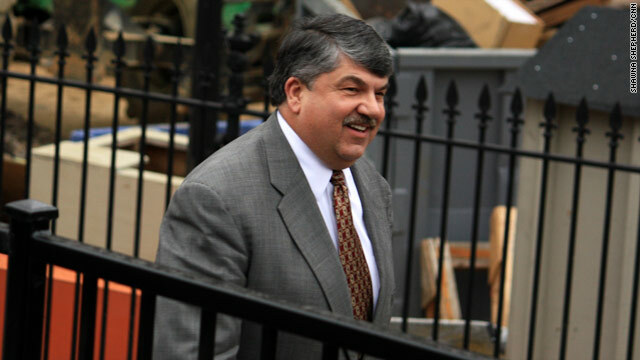 (CNN) - The day after the U.S. Senate passed a bill averting the fiscal cliff, AFL-CIO President Richard Trumka issued a statement chastising lawmakers for some of the tax provisions included in the measure. 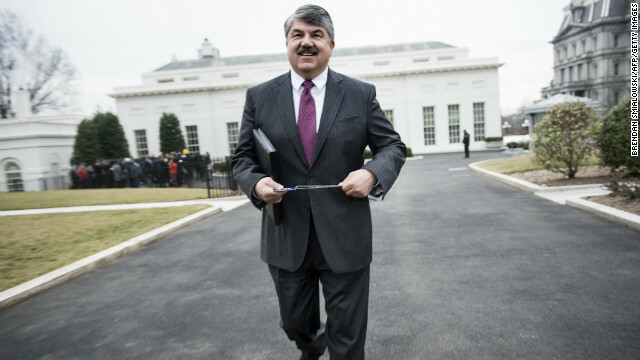 "Lawmakers should have listened even better," Trumka wrote. "The deal extends the Bush tax cuts for families earning between $250,000 and $450,000 a year and makes permanent Bush estate tax cuts exempting estates valued up to $5 million from any tax. These concessions amount to over $200 billion in additional tax cuts for the 2%." The full statement from Trumka is after the jump. 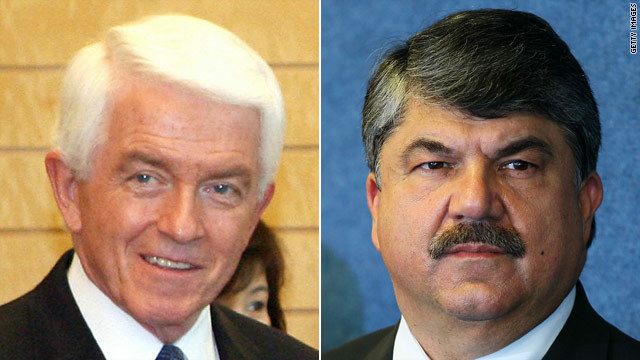 Washington (CNNMoney) - AFL-CIO President Richard Trumka accused House Speaker John Boehner of blackmailing America for withholding his vote to raise the debt ceiling unless there are drastic spending cuts. "Now we see Speaker Boehner and his colleagues engaged in a new round of blackmail with a ransom note that reads: 'Cut Medicare, dismantle the government, destroy hundreds of thousands of jobs to fund more tax cuts for the rich, or we will cause the United States to default on its debts'," Trumka said in a speech at the National Press Club on Friday. 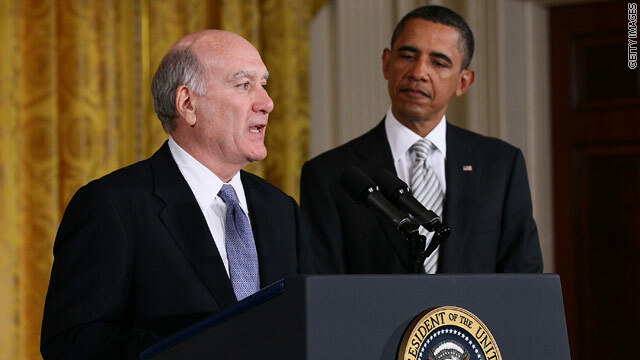 (CNN) - Weighing in on President Obama's choice for chief of staff, the progressive organization MoveOn.org criticized William Daley for his close ties to "big banks and big business." "With Wall Street reporting record profits while middle class Americans continue to struggle in a deep recession, the announcement that William Daley, who has close ties to Big Banks and Big Business, will now lead the White House staff is troubling and sends the wrong message to the American people," Justin Ruben, executive director of MoveOn.org said in a statement. (CNN) - The president of the National Small Business Association on Sunday morning endorsed congressional Democrats' and President Obama's small business jobs bill. The bill will "will free up a lot of credit for small companies at a very low cost of capital for the government," Todd McCracken told Candy Crowley on CNN's State of the Union. "Putting money in the pockets of both consumers and small business people so they can take advantage of the opportunities when they come along is crucial," McCracken said. The bill authorizes the creation of a $30 billion lending fund that would deliver ultra-cheap capital to community banks. It also provides $12 billion in tax relief to small businesses between 2010 and 2020, and $1.5 billion in grants to state lending programs. Senate Republicans blocked the bill from a vote before Congress' August recess. They oppose the bill because they say it doesn't do enough to encourage small businesses to create jobs.